Artisanal grilled cheese and savory falafel, make room for some sizzling hot dogs. Joining the fleet of food trucks on and around High Street is Dave’s Hot Diggity Dogs, a family-run food cart that caters to the late-night cravings of Wesleyan University students and Middletown residents. 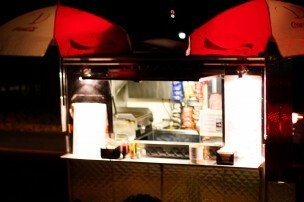 From gooey cheese dogs to steaming sandwiches, the motorized cart carries the all-American classics. Hot Diggity Dogs joins Wesleyan’s impressive collection of late-night dining options, providing a quicker alternative to the classic and beloved Mamoun’s Falafel and Whey Station’s grilled cheese. It also joins another new food truck that frequents the Wesleyan campus: Ron’s Kitchen, which offers American breakfast and lunch options like pancakes and mac and cheese. The Rogalski family, founders of Hot Diggity Dogs, began running the enterprise in its current location two months ago, though the history of the business stretches farther back. In 2000, David Rogalski Sr. stationed the wagon at the corner of Main and Court streets, where he conducted most of his transactions. During its fledgling stages, the cart also spent some time on High Street before going through a brief period of inactivity prior to its recent reopening. Rogalski enlists the culinary expertise of his son, David Rogalski Jr., who works the burners during the late evening hours. When Rogalski Jr. isn’t serving up hot dogs by College Row, he’s working as a full-time chef at Blackbird Tavern in Middlefield, Conn. Some students have lauded the cart’s return. Students at the University aren’t the only ones taking advantage of this new late-night dining option. Even Middletown residents have embraced the cart and the options it offers. 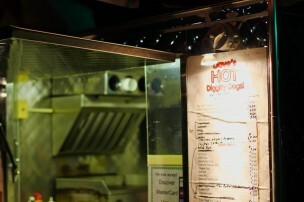 According to Rogalski, the wagon’s most popular items include the steak, egg, and cheese dog and the Dave steak, which consists of onions, peppers, bacon, mushrooms, jalapeños, cheddar cheese, and hot sauce. Since the cart’s inception, Rogalski said that one of the biggest transitions has been expanding the forms of payment they accept, which makes the cart accessible to a wider array of customers. In comparison to its former Main Street location, at its new location Rogalski reported an overall improvement in business. “A lot of kids carry credit cards, and we do accept Visa, Mastercard, and Discover,” Rogalski said. In addition to its Friday and Saturday High Street operation, Dave’s Hot Diggity Dogs caters events ranging from birthday parties to community events. The cart is even getting involved with Middletown Public Schools this month. Rogalski looks forward to watching the business grow.